The Minister of Foreign Affairs of Liberia, His Excellency Gbehzohngar Milton Findley has asserted that as part of its agenda, the George Weah-led Government’s aims are to improve the livelihood of the ordinary Liberian people and strengthen bilateral ties with strategic Partners across the globe. Minister Findley was speaking on Tuesday, September 11, when the Japanese Ambassador to Liberia His Excellency Tsutomu HIMENO met with Liberian stakeholders at the Joint Steering Committee’s Meeting between Japan and Liberia. The meeting which took place in the Minister’s Conference room of the Foreign Ministry brought together representatives from Government Ministries and Agencies. Making opening remarks at the meeting, Foreign Minister Findley noted that Liberia has had an excellent bilateral relationship with Japan over the years and is still determined to continue this cordial and friendly relationship with Japan. Minister Findley used the occasion to welcome the Japanese Ambassador to Liberia on behalf of President George Manneh Weah adding that Liberia remains eternally grateful for the level of projects being implemented by Japan in Liberia. Minister Findley stated that the Joint Committee’s Meeting with the Japanese authority is the first of its kind, following the inception of President Weah’s Administration which he noted will serve as a preparatory meeting for the upcoming TICAD summit in japan. The Minister hoped that as the bilateral ties and friendship between Liberia and Japan grows from strengthen to strengthen, Liberia remains focused in implementing projects that have been designed and agreed upon by the two states, aimed at improving their relationship for the mutual benefits of the two countries. “This government has decided to make Japan a strategic partner in our development goals,” Minister Findley stressed. The Liberian Foreign Minister also reiterated and outlined proposals for consideration by Japan including the construction of affordable housing facilities, specifically 282 units in Cesstown, Grand Kru County, for local dwellers so as to improve their standard of living. The Dean of the President’s cabinet named the Modernization of the Gorbachev market in the Red-Light community; the Construction of drainages in flood affected communities; the connection of roads in Monrovia as well as the rehabilitation of LPMC warehouses in Lofa and Bong counties respectively. According to him, the implementationof these projects would enhance economic growth and development in the country. For his part, His Excellency Tsutomu HIMENO Ambassador Extraordinary and Plenipotentiary of the Republic of Japan to Liberia stated that he is happy to be back in Monrovia noting “I would like to echo our sentiments and inform that Japan is similarly happy with her relationship with Liberia, and looks forward to enhancing this cordial relationship”. The Japanese Envoy further added that Japan and Liberia share essential values of democracy- thinking about their people; working to promote international peace and stability. He said Japan looks up to Liberia for collaborative partnership for the mutual benefit of the two peoples. Ambassador HIMENO who is resident in Accra, Ghana said Japan is prepared to promote the development agenda of Liberia. He urged the Government of Liberia to put forth its visions and priorities agenda stressing Liberia is a strategic partner to work with. 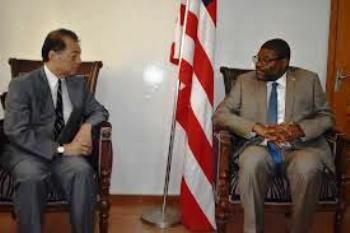 The Japanese Ambassador reaffirmed Japan’s commitment to helping Liberia implements its Pro-Poor Agenda.